Alior Bank has grown in the years through acquisitions of Meritum Bank in 2015 and Bank BPH in 2016. The latest merger with the demerged operations of Bank BPH went through successfully. Integration costs were less than expected, synergies greater than expected and the bank now expects synergistic benefits to come in 2018, one year earlier than expected. Alior Bank is now itself a possible acquisition target for Bank Pekao SA although this has not been finalized. The synergies of the merger augur well for profit margins in the next two to three years. Besides these benefits, the bank is also pursuing cost reductions through automation, e.g. in its back-office processes. Analysts expect net profit margin to expand from 19.2% in 2018 to 21.9% in 2019 and 23.4% in 2020. Alior Bank is one of the top 10 large financial groups in Poland. The bank was highly rated, notably voted as the Most Innovative Bank by BAI Global Banking Innovation awards in 2012 and the Best European Retail Bank by Retail Banker International in 2015. With a not-so-long history of 10 years, it readily embraces innovation in order to better service its customers. The bank plans to invest PLN 400 million in innovation projects over the next four years. Recently, it teamed up with Berlin-based solarisBank, Raisin and Mastercard to launch a pan-European digital bank in the fourth quarter of this year. This digital bank will allow Alior Bank to deliver multi-currency accounts with international transfers and deposits to all EU citizens. 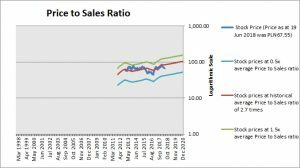 After the stock had a good run in 2016 and 2017 due to good earnings results, the stock price has fallen by about 13% since the start of the year and now presents a good buying opportunity. 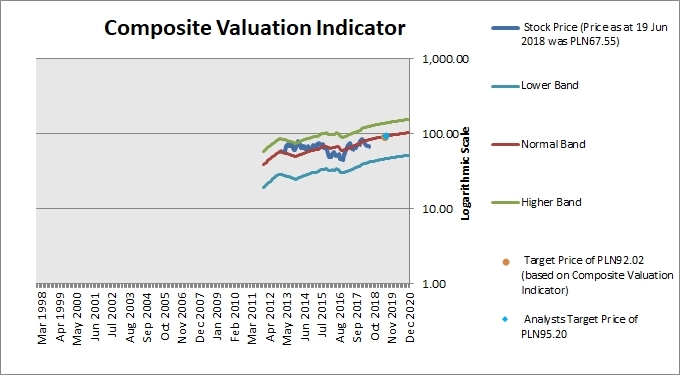 Despite the favourable prospects, valuations are still attractive. 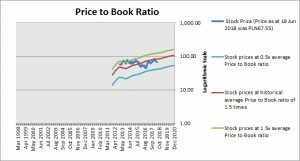 We first look at valuation from the standpoint of popular indicators – Price to Earnings, Price to Sales, Price to Cash Flow, Price to Book and Dividend Yield. At the price of PLN67.55 as at 19 Jun 2018, Alior Bank Sa is trading at a Price to Sales Ratio of 2.2 times last 12 months sales. 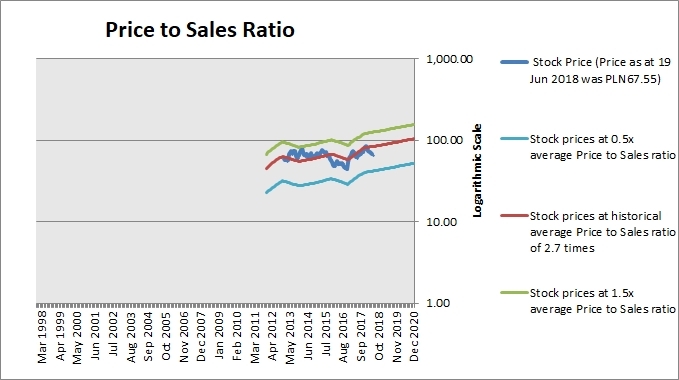 This is a 19.0% discount to its historical average Price to Sales Ratio of 2.7 times. 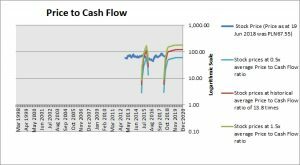 At the price of PLN67.55 as at 19 Jun 2018, Alior Bank Sa is trading at a Price to Cash Flow Ratio of 47.5 times last 12 months cash flow. This is a 244.0% premium to its historical average Price to Cash Flow Ratio of 13.8 times. 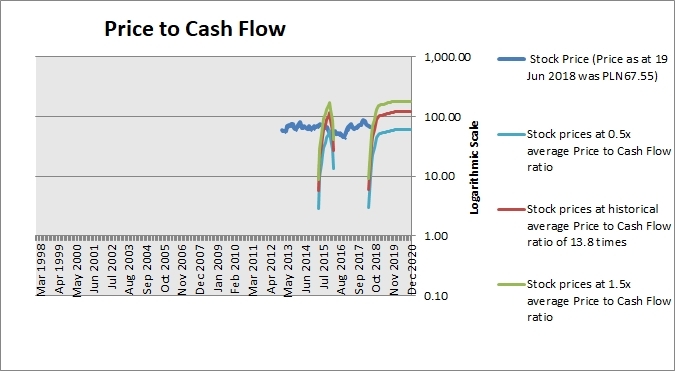 However, the historical average Price to Cash Flow ratio cannot be determined with accuracy due to the short history. At the price of PLN67.55 as at 19 Jun 2018, Alior Bank Sa is trading at a Price to Book Ratio of 1.3 times current book value. 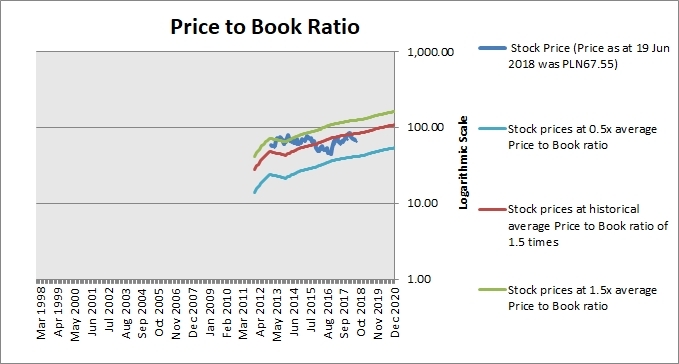 This is a 18% discount to its historical average Price to Book Ratio of 1.5 times. 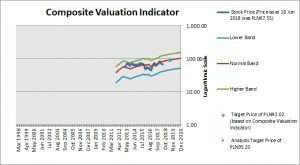 Based on the Composite Valuation Indicator, the stock has a Target Price of PLN92.02 within a 12-month period. Our Target Price represents upside of 36.2% based on stock price of PLN67.55 as at 19 Jun 2018. We believe that Alior Bank SA is an attractive stock which is trading at attractive valuations. It is a well-run bank and highly rated by independent parties. The bank has shown its ability to grow organically and via successful acquisitions. In addition to revenue growth, investors can look forward to margin expansion coming from the synergies of the mergers and from internal cost-cutting measures.